Every Republican and Democrat running to be Michigan’s next governor proclaimed their support Thursday for requiring state political candidates to release details about their finances. Not all of them have lived by those words. In February, Bridge Magazine asked 19 candidates who at the time said they were campaigning for governor — from both major political parties, third parties and candidates without a party affiliation — to disclose their 2016 tax returns and details about their personal finances, in line with the disclosure rules for federal candidates. That list included earned income, payments for speeches or appearances, gifts, other assets like real estate holdings and travel reimbursements. The request also included information on their spouses. Michigan was recently ranked at the bottom of states for transparency in government. Of the seven Republican and Democratic candidates who filed to run for governor and appeared at the East Lansing forum Thursday, four responded in full to Bridge’s request — Republicans Lt. Gov. 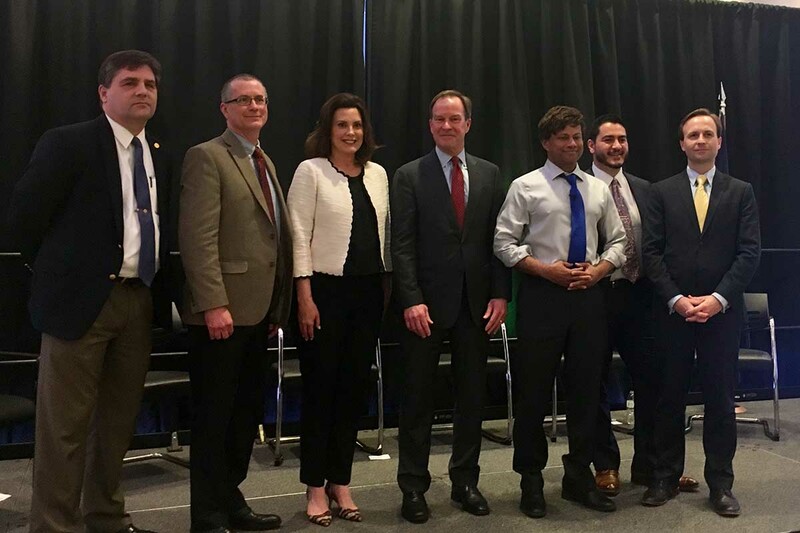 Brian Calley; Jim Hines, a Saginaw physician, and Attorney General Bill Schuette, and Democrat Abdul El-Sayed, the former Detroit health director. All seven candidates to succeed Gov. Rick Snyder appeared onstage together for what is believed to be the first time,at the Michigan Press Association annual convention in East Lansing. Republican state Sen. Patrick Colbeck, of Canton Township, did not earlier disclose his financial details to Bridge. On Thursday, he told an audience that he and his wife liquidated their retirement assets to run for office and he has taken a pay cut as a state legislator. “This is not something we are doing to financially enrich ourselves,” Colbeck said during the forum, adding that a bigger issue is former lawmakers who are term-limited out of the Legislature not having to disclose their finances as they push for legislation in new roles outside the Capitol. Democrat Gretchen Whitmer, a former Senate Minority Leader, released her personal 2015 and 2016 tax returns filed separately from her spouse. She did not release her husband’s tax returns or any additional details about her finances. Calley and Schuette had a tense exchange on stage relating to finances, as Calley accused Schuette of diverting “millions of dollars in offshore assets,” even though Schuette has said his assets are protected in a blind trust. Schuette did not address the documents Calley cited, calling the move a political stunt by a candidate trailing him in the polls.